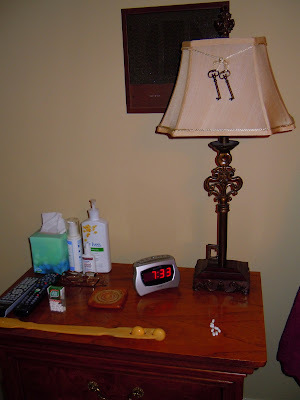 I really hated to show our nightstands because compared to a lot, they just do NOT have a lot of Pizazz! But, guess that's what makes this "show and tell" so interesting. Now, just how "blah" can a nightstand be, think ours would probably get the award for sure. But, now functional, they are certainly that. 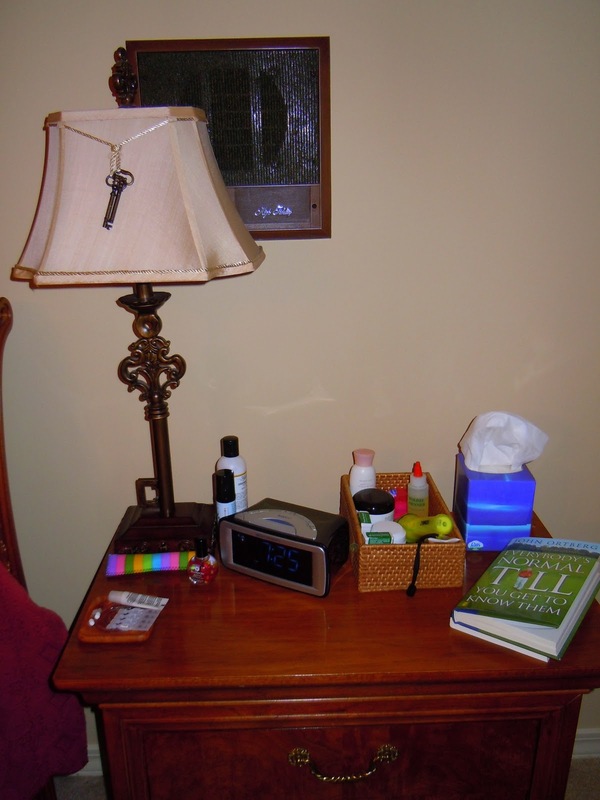 ~chuckle~ As you can see, mine houses my latest read, lotions of every scent and description for the hands and feet, lip balm for the drying lips, my daily eye drops, clock radio and my trusty flashlight for those nightly runs. Oh, and I almost forgot, the box of Kleenex. Yep, just as I said, pretty blah and not very interesting. But, hey, the lamp is attractive. But, there you have it and just so you will not think that our entire bedroom is that blah, I snapped these other two pictures that have a little more charm to them and really are a lovely addition to our abode. I display my collection of Willow Tree here along with some plants. Now, this was just too much fun and I just may have to become a regular participant. Wishing for each of you a day full of joy and happiness! I love Willow Tree, too! Love the plants with them! 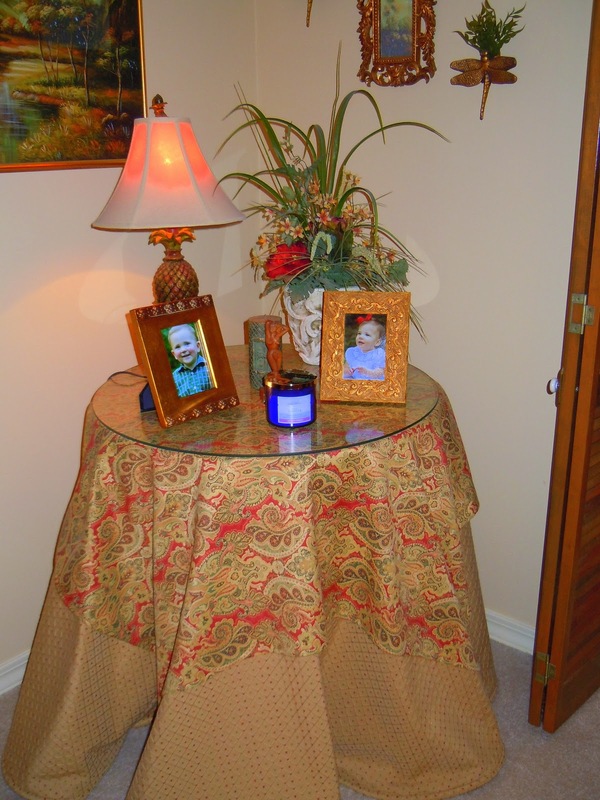 I love the cloth/colors on that corner table! I love the nightstands...that is what they are for...and besides I like seeing people live in places and not just for show!! Mine are stacked with books and journals. Love the willow collection...I have two. Thanks for letting us drop in...what a fun post. Your lamps are beautiful and I am LOVING your round table! You're right, it is certainly fun to play along :) And I agree that the lamp is indeed attractive. Very nice! Hope you are feeling back to yourself again. I love your house...your night tables look like you live with them, that is how they should be! I would be mortified for someone to see mine right now! Hope you are feeling better! Thanks for stopping by my blog! 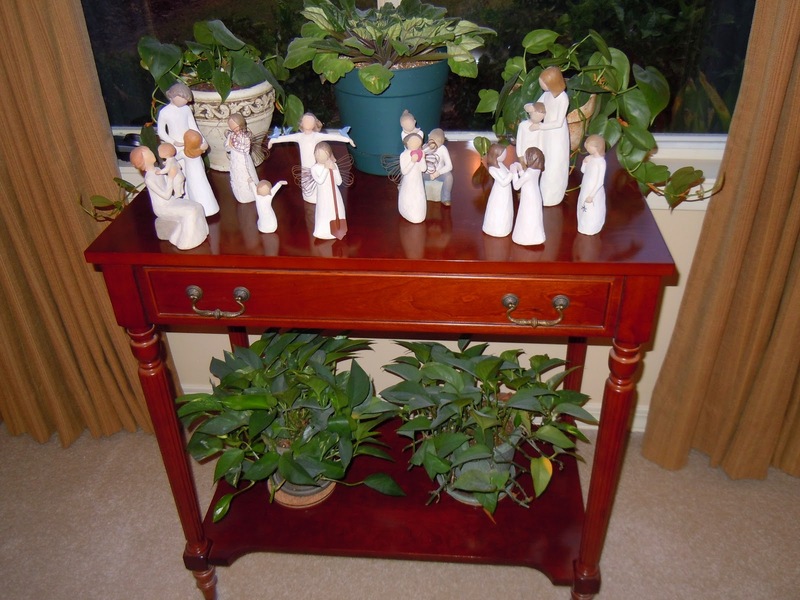 I love the collection of Willow Tree figurines! I have one as well that was started when my husband and I were married and now include the mother & child, father & child, a family of three, and twins. They all fit our family perfectly! What a fun linky party this was! The lamps are beautiful. And I love the table full of Willow Tree. 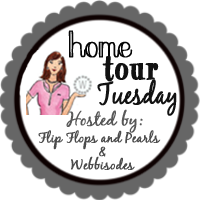 Stopping by from the Home Tour.